At last, the 2016 sales stats; but, before I get to the numbers, I would like to say a few words about my data source. 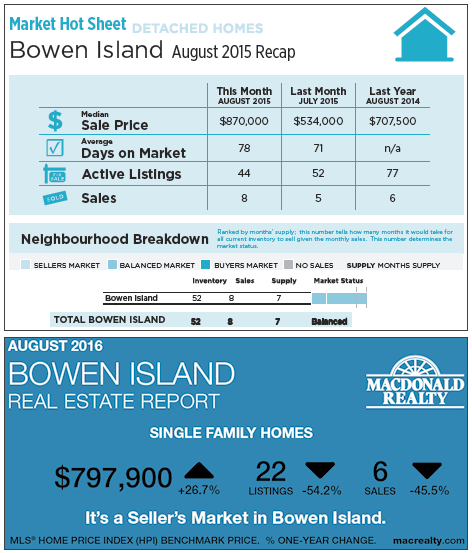 I've only found one realty firm that posts month-to-month sales stats for Bowen Island – Macdonald Realty. You can find those stats for BI and for all board areas posted to MR’s blog. They also post stats for Whistler, Squamish, Greater Victoria and the Okanagan. 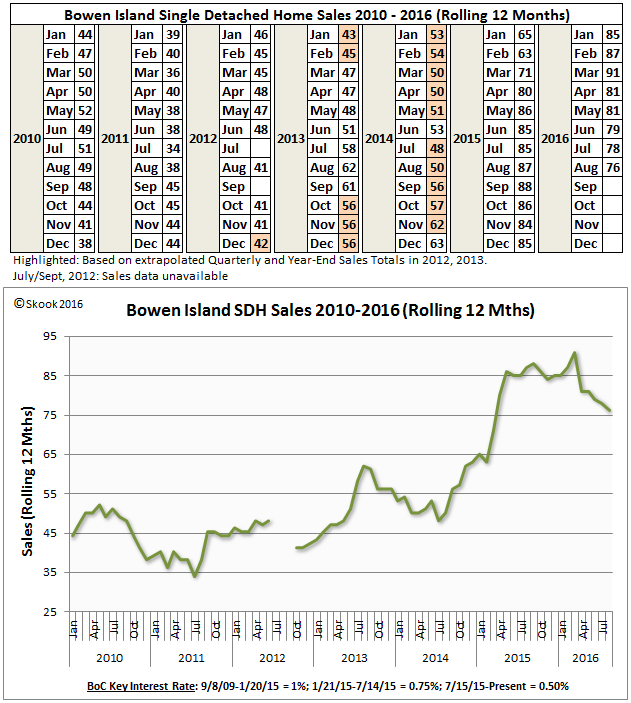 MR began posting Bowen Island sales stats as a downloadable .pdf file back in Feb 2015. These ‘Market Hot Sheets’ gave the number of sales, the median sales price, average days on market and number of active listings for the current month, preceding month and year-over-year. As well, they illustrated the market status: sellers, balanced or buyers. I was impressed with those ‘Market Hot Sheets’; but, I’m not impressed anymore. This January, MR replaced the .pdf file with a .jpeg image, changed the name to ‘Real Estate Report’ and dumbed it down. You can see for yourself in the image below – at the top is the August 2015 BI 'Market Hot Sheet' (light blue shading) and below it the August 2016 BI 'Real Estate Report' (dark blue). Brilliant, just brilliant. I’m not sure how to interpret the move to this new format. I guess I could give them the benefit of the doubt and say it’s a cost-saving decision; after all, they are paying an employee to prepare the stat docs each month. But, really, once you have a template you only need to slot in the numbers which you get from the board and hit ‘make pdf’ and upload the file to the blog. There seems to a correlation to this dumbing down of everything internet related and increased smartphone use. Oxymoron aside, you’ve seen this the last few years with websites in an attempt to function across all various platforms (smartphone, android phone, tablet, laptop, desktop, etc). There’s a lot more white space, more images and a lot less text and on the whole this equates to a lot less information. With the move to these new websites, past data is being purged which is the greatest loss. Well, it is what it is and to fill this dearth in BI stats data, Skook has stepped up to the plate. Let’s start with the MR Market Report which I’ve used along with the Board’s benchmark sale price data to create the table on the left. I worked backwards from those % changes to determine the underlying 2015 figures. It is easy to see that sales are falling compared to 2015. On a year-to-date basis (Jan to Aug), sales are off by -19.7%. The columns on the table’s right side show why – no inventory and lack of listings raises prices (classic supply and demand) as reflected by the benchmark sales price which in August was up +26.6% year-over-year. If you read my BI - Dec 2015 Sales Stats report posted earlier, you are might remember the table on the right above. 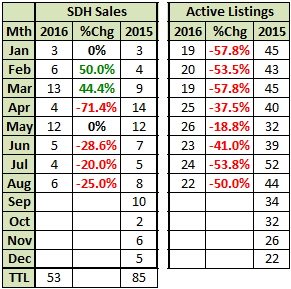 The first column is the sales reported by Macdonald Realty each month in its ‘Market Hot Sheets. The second column shows the sales data from BI Realtor ® Dee Elliott’s year-end summary posted to her Facebook page in January 2016 (Macdonald Realty is her brokerage firm). You can see their year-end totals don’t jive. So, working backwards to get the underlying 2015 sales numbers, you can see that MR has revised the sales total for June, July and August 2015 and they now agree with Elliott’s numbers. What this really means is that the Board has revised its monthly totals for 2015. 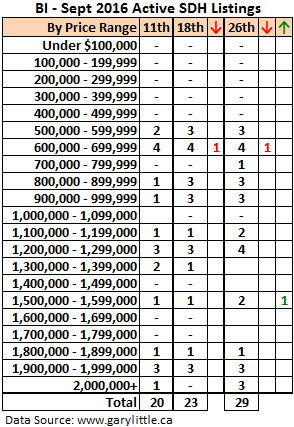 The table on the left below shows how the sales % looked when I used the 2015 sales total from MR’s monthly reports. Now, as for that active listings table on the right, again I initially pulled the 2015 figures from last year’s reports, but I noticed the % changes MR was showing this year (see above) weren’t agreeing. Now, I can understand sales data needing to be revised (maybe due to deals falling through, or closures delayed, etc), but revising the Active Listings numbers? I can’t figure that one out. If I subtotal the 2015 Active Listings being reported this year and compare them with last year’s YTD figures there is a difference of 18 listings. No, that is not much but this is a really, really small market. The point I what to make is that if these differences can occur in such a small market, imagine what may be happening in all the other Board market areas especially under these gonzo circumstances. Buyers and Sellers make decisions based on the stats given to them by Realtors ® who in turn get them from the Board. At the current selling prices, there is a lot at stake resting on those stats. 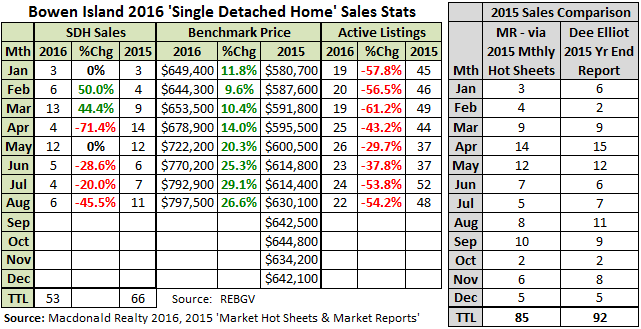 The next table is an historic look a detached sales month-to-month reaching back to 2004 with subtotals for 2014 to 2016. This year’s sales are down -19.7% versus 2015 but up +39.5% compared to 2014. In my BI-2015 Sales Summary posted here earlier, I introduced myself and maybe you to the concept of a ‘Rolling 12 Months’ calculation used by business (and the Board) to show market trends. I showed in the Summary that this works especially well in a very small market. I’m adding this data to my month reports, but I’m only going back to 2010. Just a reminder...each monthly sales figure in the table is arrived at by adding together 12 months of sales: Jan 2016 = Feb 2015 → Jan 2016; Feb 2016 = Mar 2015 → Feb 2016; Mar 2016 = Apr 2015 → Mar 2016 and so on...which explains why it is called a “Rolling 12 Months”. You’ll notice that I’ve added Bank of Canada key interest rate info to the bottom of the chart. A complete history of interest rate changes back to 2007 is included in my ‘BI – 2015 Sales Summary’. The BoC kept interest rates at 1.0% for just over six years and then dropped the rate to 0.75% on January 21, 2015. BoC Governor Stephen Poloz has been highly criticized for that drop and the subsequent drop on July 15, 2015 because they failed to stimulate the economy as intended. 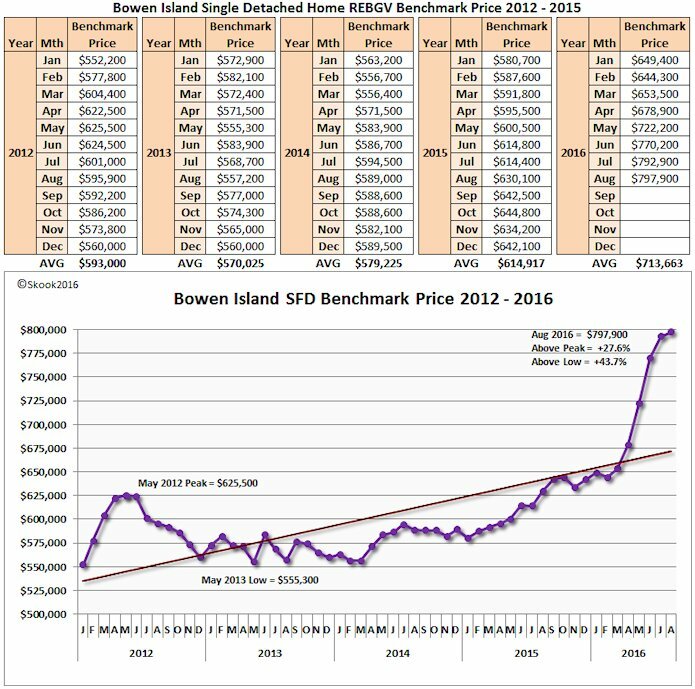 Instead, the interest rate drops only added fuel to the fire of an already highly overheated real estate market and it definitely impacted Bowen Island as you can see in the chart with that almost vertical rise in sales beginning March 2015. I don’t for a minute believe its sheer coincidence. In her 2015 Sales Report, BI Realtor® Dee Elliott wrote, “Many of our clients were first time buyers looking for homes below $750,000. 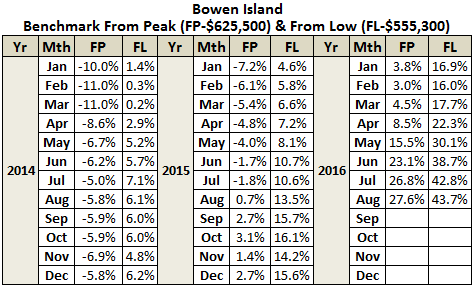 Bowen’s lifestyle and relative affordability when compared to Vancouver were the driving factors.” It was FOMO (Fear of Missing Out) driving those first time buyers and when Poloz dropped the interest in Jan 2015 those first timers jumped into home ownership. The million dollar question is are they living close to the edge with that mortgage debt? If so, what will happen if and when interest rates rise or if this real estate market goes “POP”. Next up, it’s the MLS® HPI Benchmark Sales Price table and chart. I’ve been calculating a yearly average for the BI SDH Benchmark and we can see in the table that the 2016 year-to-date average is almost $100,000 up on 2015’s year-end average. The REBGV says the value of the benchmark price is that it’s the purest method for indicating market trend. The chart shows the benchmark is rising but not at the parabolic rate of the last eight months. However, compare that chart with the ‘Rolling 12 Months’ chart above which according to one business website, “...is a valuable tool for any organization to use to track its progress and to show trends.” That chart indicates the BI market turned in April and we’re now seeing a steady decline in sales. I drew attention to this benchmark lag in my 2015 Sales Summary and said you should keep that fact in the back of your mind; now you know why. I have been noting each month the % change in the benchmark relative to the last peak in May 2012. I thought this month, “Hey, why not compare it to the benchmark when it bottomed in May 2013”. Why not indeed - so, I have. I only calculated back to Jan 2014 because it’s apparent by the chart that sales started their current climb in April that year. The table below shows the % change results. The August 2016 benchmark is +27.6% above the May 2012 peak price and +43.7% above the May 2013 benchmark low. I feel my eyes moistening; I’m so happy...really I am. I mentioned supply and demand earlier. Sales slow down when there isn’t much to buy and we know inventory is down over -50% compared to 2015. So, what is on the market this month – well, I’ve put together a new table for that, too. And, you wonder why it’s taking me so long to post these stats. I have got to stop this or the Sunshine Coast stats will never see the light of day. Look at that, there is nothing under $500,000 – if those properties existed no doubt they were snapped up by Dee Elliott’s “first timers” back in March and April last year being inspired by that nice new BoC interest rate and all. It does look like inventory is creeping up, though – always an interesting sign when the market appears to be slowing. Another interesting event is that one price drop in the $600,000 dollar range (1229 Adams Rd, R2102619. Listed Aug 22nd @ $699,000 and dropped to $679,000 on Sept 14th...listing pics show the house is empty...the drop could imply an anxious seller. I wonder where they went?). As for that dumb, dumb price increase, it’s a waterfront property at 1483 Webb Rd (R2025332) and is listed with Angel Hasman & Assoc. Realty out of West Van. This might go some way in explaining the price rise on Sept 23rd from $1,388,000 to $1,588,000 despite having sat on the market since its Jan 15th listing; and, the inclusion of those lucky “8s” in the pricing. Yessiree, it was just priced too darn low for the target market that now has to fork over a 15% foreign buyer's tax. Bummer. Interestingly, this property was listed back in 2011 at $1,289,000 with a price drop at one point to $1,250,000. No idea if it sold back then or not. Right, that’s it I’m done with Bowen until the next Macdonald Realty stat .jpeg is posted which will be...next week! Piece-of-cake, cause I got ...templates!!! “But here’s the thing. The market was already rolling over. Sales in Vancouver peaked in March (5,173) then steadily wilted through the spring before hitting bottom (so far) in July (3,226). This 38% toppling in market activity happened at the same time benchmark prices for detached homes were rising by $235,000, or 17.5%. That’s the essence of a dangerous asset – bloating price on collapsing volume. It shows fewer and fewer buyers were entering the market, that prices were being skewed higher on a reduced number of trades, and a correction was already beginning." What did I say in my post above? "It does look like inventory is creeping up, though – always an interesting sign when the market appears to be slowing." "That chart [Rolling 12 Months] indicates the BI market turned in April and we’re now seeing a steady decline in sales. I drew attention to this benchmark lag in my 2015 Sales Summary and said you should keep that fact in the back of your mind; now you know why." BI turned in April therefore it peaked in March and there's that benchmark lag, again. Oh, and no, I didn't read Turner before writing this post. I just think that finally after researching real estate statistics for over the past three years I might be finally getting a handle on things. Well, it took long enough.